Long version posted recently by CBB. The longer version show's a wider angle before the magic zoom and the "arrival" of the translucent blob. I took a screenie at the opening moment of the scene, I did it again, and got the exact same time, 7:38. It's only a rough estimate of distance, but it cant be too far out. BBC Rewrite "Hijackers Still Alive" webpage. Under the FBI picture of Waleed al Shehri we have added the words "A man called Waleed Al Shehri..." to make it as clear as possible that there was confusion over the identity.. There is a open comment section, please bombard them right now. Off you go now!! WASHINGTON — The American Al Qaeda spokesman known as "Azzam the American" will be indicted Wednesday by a federal grand jury in Los Angeles, FOX News has confirmed. The two guys above are known collectively as Adam Yahiye Gadahn ?????????? An Algerian pilot mistakenly accused of training the 11 September hijackers has won the right to challenge a decision not to compensate him. 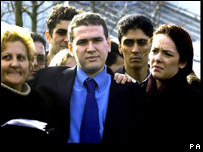 Lotfi Raissi was never charged with any terrorism offence but spent five months in Belmarsh high security prison. Although a judge later said there was no evidence linking Mr Raissi to terrorism, the Home Office said he was not entitled to compensation. Drill day at the Pentagon. I dont even bother with the Pentagon these days, this is probably why. You took your eye off the ball, didn't you? If it's not breaking any board guidlines, I would like to post some of my favoutie photos, which I have collected over the years. God that sounds awful, for those who have been truthlings since day one. We need to wrap this up, guys, it's been five years. First of all thanks to the mods for lifting my ban. "Don't let them provoke you. Don't let them provoke you.. There was no impact, no splash of aluminium, steel and concrete. The area on the building between the left engine and body appears intact. How? Does anybody know if this was available elsewhere? I re-posted it on several sites, now all the links are dead. Does not the absence of an airplane at Shanksville concern anybody?. I hope someone has saved this, I didnt. The video appears to have been pulled. This is the new one with the ladies talking. Has anyone here seen this cheezy docu-drama? 9/11: The Twin Towers. It went out here last night, I usually watch these things for real footage to see what can be gleaned from the crap. Last night was NO didfferent. This is what they showed. NOTHING. There is NO airplane in this footage. My feelings, though I can't be sure, are a missile. And, there is NO RECORD of Flight 11 having "taken off" on Sept 11,2001. Dear readers, it was clear as day. 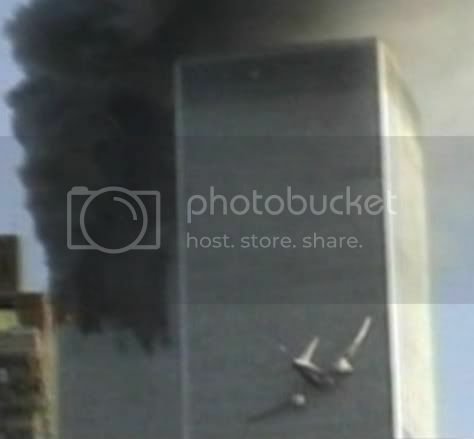 An airplane approaches the South Tower, there is some camera trickery, the airplane disappears and another cheezy cartoon airplane appears on a slightly different course and trajectory. This object also loses colour and reflectivity. My girlfriend shouted, "the other one went behind the building". Yes, yes, I saw it she said. you are right. How were people fooled by that, she said. A plane did a fly-by, and either released a missile which was covered up by then fake cartoon airplane. Or the fake plane was to conceal the dial a yield explosion, pre-planted bomb in the tower. CIA Re-opens Bin Ladin Unit?? Shut down in July, the "unit" "set-up" to "catch" "Bin Ladin" wink wink, was "reportedly" reopened today with a fat new budget. I haven't found any verification of this though. Average deaths in the USA in one day?? I did a wide open search of the SSDI database today. Died on Sept 11 2001. That was the only search criterion. 176,599 people died on Sept 11, 2001, in the USA. Nothing strange there, it seems to be an average. I tried Sept 11 2002, and 2003 -- all similar figures. Using - "Died on Sept 11 2001" as the only search parameter.